Energique, enthousiaste et surdoué, Ajja est un artiste à ne pas manquer ! Born in London in 1975 to a world-renowned family of tattoo-artists and travelers, Ajja began playing guitar and composing music as a child. Reared in a rock’n’roll and funk atmosphere, he first concentrated on these musical styles, writing hundreds of songs, recording albums and playing in numerous bands during his teenage years and early twenties. At the end of the nineties, his interest gradually shifted towards electronic music, causing him to explore new digital horizons. In 2002, Ajja and friends Master Margherita, Dymons and Flooting Grooves created The Peaking Goddess Collective, a chill & psytrance band that fuses live instruments and electronic machines. Their debut album “Organika” was released in 2007 and is considered a top-notch chill album. Even now it is still played in chill outs and on radio stations all over the world, and has featured in numerous documentaries. In 2003, Ajja, along with his partner Tanina Munchkina and their friends Master Margherita and Dj Gaspard, founded the psychedelic trance label Peak Records. The same year also saw the birth of Yab Yum, the fully digital project shared by Ajja and Dj Gaspard. Their debut album “Nocturnal Emissions”, released in December 2006, is still widely praised in the international psytrance scene. 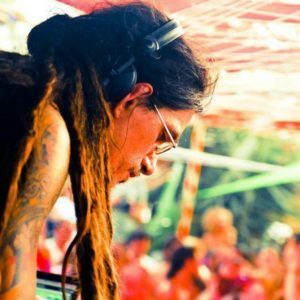 In 2005, Ajja started his eponymous solo psytrance project. Since then, his highly acclaimed live sets have rocked many a dancefloor around the world, including most of the major psychedelic trance festivals and events. His debut album “Psychogenica” was released in November 2007, on the Irish label Syncronize Records, and was enthusiastically welcomed by psy-lovers around the globe. Ajja’s second solo album, “Tulpa”, was released in 2012 and quickly took its place next to “Psychogenica” in the heart of his appreciative public. Not satisfied with so much activity, Ajja also composes music for theater plays, designs Peak Records covers with his partner Tanina Munchkina, and works as a tattoo artist in his family’s studio in Switzerland.